The “electric vehicle” (EV) revolution has certainly been much promoted and is getting even more press with the introduction of the “New Green Deal” (NGD) as a “thing.” While the NGD is much more than just an effort to replace petroleum with EV’s and in any case isn’t going anywhere soon (or ever hopefully), many other regulatory and legislative initiatives promoting EV’s, some of which are already on the books, are proceeding. These initiatives are taking place at the city, state/province, national, and even international level with the Paris Climate Agreement. Even in our petroleum-dominated state of Texas, the City Council of San Antonio, the home of mega-independent refiner Valero (and the pre-Marathon merger Andeavor), has recently voted to move forward on a plan to completely eliminate petroleum-powered Internal Combustion Engine (ICE) vehicles in the city. Although the timing of most of these (the San Antonio deadline is 2050) is far in the future, some regulations (mostly in foreign locations, but also notably in California and certain other “Blue” states) have already caused a significant increase in EV sales. The concerns about what effects this will have on the transportation fuel market has oil companies worried about “Peak Demand. But, as always, there is another side to the story – automotive manufacturers haven’t given up on ICE’s (or gasoline hybrids) and in fact some exciting new technology developments are taking place. At the same time, the Trump Administration’s decision to rollback the post-2022 CAFE standards is allowing hybrids and ICE’s to compete in the fuel efficiency game. The 1984 song “Together in Electric Dreams” was the only commercial success for the British/Italian partnership of Philip Oakley and Giorgio Moroder and was the soundtrack for the film “Electric Dreams.” That film, which tried to follow up on the success of “Flashdance” (which employed the music of Moroder), was a failure at the box office. In today’s blog, we examine the challenges EV’s might face from petroleum fueled hybrids and ICE’s and whether the EV “dream” will be closer to the success of the soundtrack or the failure of the movie. Rapid growth in global EV sales (including plug-in hybrids) continued in 2018 and many forecast the EV growth trajectory to stay strong going forward as most major auto manufacturers continue to make aggressive investments in the space. While we believe growth will likely continue, we remain cautious and expect snags, with the growth trajectory declining from exponential levels seen recently to a more linear pattern sooner than many other analysts think. The main reason for our caution is the fact that the unsubsidized total cost of ownership for EV’s is still way above that for traditional hybrid and ICE vehicles and will not come close for some time. As a result, sales of EVs are still driven primarily by subsidies and incentives, with their numbers concentrated in select markets where those subsidies are the greatest. 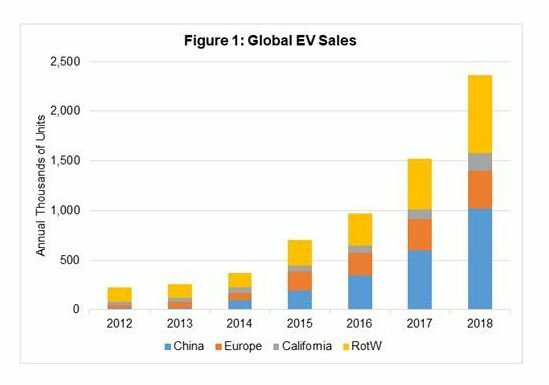 China, of course, has come to dominate the EV market, accounting for roughly half of total EV sales globally last year. In the U.S., California shows the same level of dominance, accounting for about 50% of total domestic EV sales, despite representing only about 10% of the U.S. population. Norway is another demand center, accounting for almost 4% of global EV sales last year despite having a population of only 5.3 million (<0.1% of the global total). All of these markets have generous EV purchase subsidies (particularly in Norway). China and California have minimum sales quotas for clean vehicles, and China directly and indirectly subsidizes a number of EV manufacturers as well. All three also provide additional powerful nonmonetary incentives, such as HOV / bus lane access and priority vehicle registration (with this last point being especially relevant in China, where wait times to register a new ICE vehicle in major cities can stretch months or years). In markets with minimal EV incentives, EV sales have struggled to get off the ground. In Australia, for instance, EV sales have remained stagnant at ~0.1 – 0.5% of total new vehicle sales for years. Figure 1 shows global annual EV sales since 2012. The current and future ICE vehicles are not your father’s Chevy (or Ford or Chrysler or Mazda for that matter). Various improvements, including direct fuel injection, Continuous Variable Transmissions (CVTs), and hybrid technology, among others, have contributed to the improvements in ICE fuel efficiencies. As a result, sales weighted average fuel economy for new passenger cars in the U.S. have increased 28% from 29.5 MPG for model year (MY) 2004 vehicles to 37.7 MPG for MY 2016 vehicles. 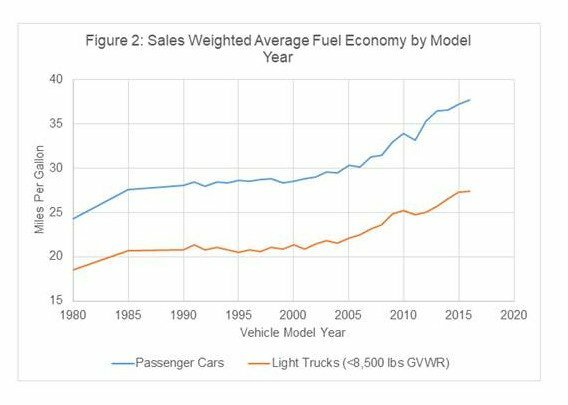 For light trucks, we’ve seen a similar trend, with fuel economy increasing from 21.5 MPG to 27.4 MPG over the same time period. These impressive increases are shown in Figure 2. While, aggregate data beyond the 2016 MY is not available, there is no indication these gains in new vehicle fuel economy are slowing. As automakers continue to make incremental improvements to conventional ICEs, they are also developing more radical new technologies to achieve even better fuel economy. We discuss two of the most important of these breakthrough technologies below. While EVs already offer essentially no decrease in lifecycle CO2 emissions over modern hybrids (an issue we discussed here), hybrid technology continues to improve. Toyota (the inventor of the hybrid and still its largest backer) recently released its new 2019 Rav4 Hybrid, which is rated for an EPA combined 39 MPG at an MSRP of $27,700, just $800 above the comparable nonhybrid trim, despite offering more horsepower and a 9 MPG improvement in fuel economy. We note this information not to sound like a commercial for Toyota, but simply to illustrate how affordable and efficient hybrids have become. 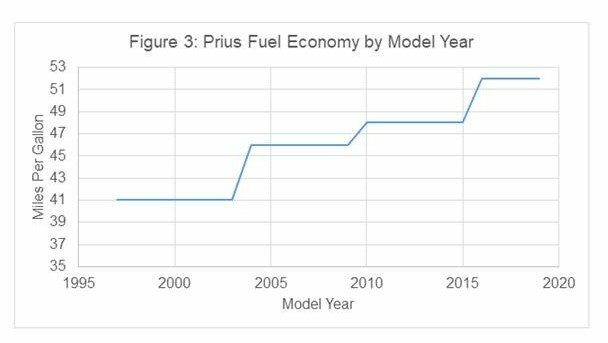 Lastly, in Figure 3 we show the historical improvements in fuel economy for the Toyota Prius, the first commercially available hybrid vehicle. Through continued improvements in the technology, Toyota has increased the standard Prius’ fuel economy from 41 MPG at its launch with the MY 1997 vehicle to 52 MPG with its most recent iteration. Moreover, we expect these improvements to continue and also to see hybrids available across a larger cross section of vehicles going forward. EVs, on the other hand, have much less room for improvement, as their electric motors are already ~85-90% efficient. Mazda’s new gasoline compression ignition engine (branded SkyActiv-X) represents another important advancement in ICE technology that may challenge (or outperform) EVs when it comes to lifecycle CO2 emissions. It has the potential to produce diesel-like fuel economy and torque from a gasoline engine and will debut later this year in the MY 2020 Mazda 3 (which will initially only be available in Europe)t. Timelines for future availability of the technology in other models and geographies have not been disclosed, but we would expect them to come in the next few years. Mazda estimates an approximately 20-25% improvement over conventional fuel economy with these new engines. Further, this technology is still very young and additional improvements seem likely. Lastly, the SkyActiv-X engine may also have the ability to be used in larger vehicles that are typically powered by diesel due to its improved torque relative to a conventional gasoline engine. In this application it may not significantly reduce CO2 emissions relative to diesel, but would reduce NOx and particulate emissions, as gasoline engine emissions of these pollutants are very low. In summary, while EVs have become the poster child for reducing vehicle CO2 emissions and sales have grown rapidly as a result (and certainly supported by government initiatives and subsidies), many emerging ICE technologies present similar or perhaps even better opportunities for reducing emissions of CO2 and other pollutants at a more affordable price point for consumers. We expect these technologies to gain more traction going forward. Additionally, while increasing fuel economy will also decrease demand for transportation fuels on a per mile basis, it will also likely extend the life of the ICE in the consumer automotive market, and incentivize more driving, limiting the potential decreases in total demand. TM&C constantly monitors changes and projected changes in petroleum supply and demand across the globe. Our projections take into account changing rules and regulations, technological advancements, production and transportation costs, demographics, changes in consumer behavior, and other factors impacting supply and demand. Certainly the transportation fuel market makes up a very substantial part total demand for petroleum, and as a result, changes in engine technologies and regulations impacting those technologies will be an important part of the demand equation. We include our independent analyses of these impacts in our semiannual Crude and Refined Products Outlook (the most recent version of which was released at the end of February) and our various other studies. More information on these publications and our other work involving oil industry developments and dynamics can be obtained by contacting us, visiting our website at turnermason.com or calling John Auers or Cindy Parker at 214-754-0898.